The journey of Pine Forest Honey to your plate begins with the Marchelina Hellenica insect that inhabits the pine trees of the Aegean. This insect deposits a sugary liquid that it cannot digest on pine trees. Honeybees gather this up and process it with enzymes secreted from their bodies. Any connoisseur of flavor must get a taste of pine honey, 90% of which is produced in Turkey’s Aegean Region. 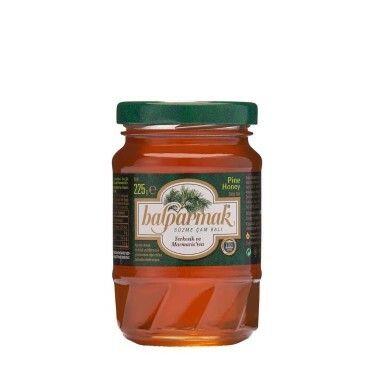 You are welcome to add this delicious 850 g Balparmak Pine Forest Honey into your life! Beat the eggs and sugar thoroughly. Mix well the flour, baking soda, lemon juice, lemon zest and vanilla. After heating oil in a pan, take a spoonful of the batter and put in the hot oil. After the batter is sufficiently fired in the oil, take it out of the pan and momentarily let the oil drip off before placing on a serving dish. Drizzle honey and powdered sugar over them and serve.